The handedness of chiral molecules is crucial for chemical processes. The chiral properties of such molecules can be studied with chiroptical spectroscopy techniques. However, their sensitivity is limited. In this chapter, we discuss the physical principles behind such techniques. A strong focus lays on circular dichroism spectroscopy, which is the most common method for chiroptical investigations. After this introduction, we discuss methods to improve the sensitivity of such measurement schemes. Plasmonic enhancement schemes, where molecules are electromagnetically coupled to plasmonic nanostructures, are reviewed in detail. We discuss different enhancement mechanisms for single nanoparticles as well as nanoparticle clusters. 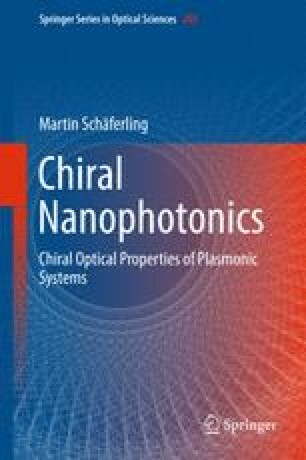 Additionally, novel schemes where the chiral analyte induces the formation of chiral plasmonic nanoassemblies, which then act as reporters for the chiral analyte, are reviewed.